In Shanghai, the first two practice sessions have been remarkably similar to those in Fuji - pretty much what you would expect in the first and then a strange mix in the second. With Hamilton comfortably ahead in both, however, he looks to have more than a reasonable chance of upsetting Ferrari's usual run of form in the Chinese GP. That will annoy some of the drivers, given their decision to put his driving style on the agenda for the drivers' meeting today. This comes at an interesting moment for them all as they begin to realize that their previous support for the FIA's regular penalties for Hamilton begins to backfire on them. No doubt the Brit's moves on Webber and Glock at Monza will be brought up in that meeting and there will be nothing said about Webber himself squeezing Massa into the pit exit area in the Fuji race. It will probably not occur to any of those so ready to criticize Hamilton that each of them has used similar tactics in the past. Hard but fair, it is called and, according to the unwritten rules of F1, it is all quite legitimate. But F1 drivers rarely accept the blame for their own mistakes, Massa's crass reasoning for his collision with Bourdais in Fuji reminding one of David Coulthard's occasionally one-sided view of his own foul-ups. Those who will raise their hand with a sheepish "mea culpa" are rare indeed but they are the ones who are beginning to understand that the stewards have opened a Pandora's box in their eagerness to penalize Hamilton. Sebastien Bourdais has had this forcibly pointed out to him with his penalty for Massa's error and is, no doubt, a convert now. Nick Heidfeld, too, has said that he thinks two of the three Fuji penalties were undeserved. So the apparent solidarity of drivers' opinion against Hamilton is beginning to crack, even as they decide to lecture him on the issue. When the danger of completely unjustified penalties is extended to oneself, it becomes much easier to believe that others have been unfairly judged in the past. The fact is that, by upholding the stewards' decision on the Hamilton/Raikkonen incident at Spa, the FIA have released a flood of penalties in succeeding GPs. Once precedent, convention and the regulations are ignored in the quest to handicap Hamilton, the stewards are empowered to interfere with races as and when the result does not suit them. And the suggestion that they went against the recommendation of Charlie Whiting in the Massa/Bourdais incident merely underlines this. What is surprising is the length of time it has taken for the drivers to realize the implications for themselves. I do not think it will do Hamilton any harm to hear the other drivers' opinions in that meeting, however. 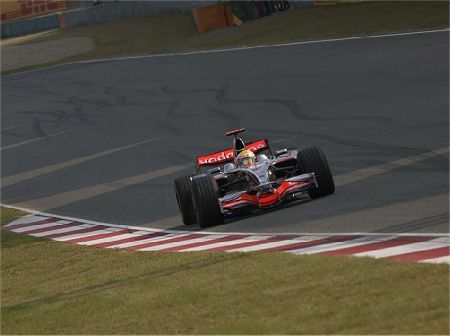 With the championship so nearly within his grasp, anything that helps to control his natural impulse to take chances can only assist him in the final two races of 2008. It may well be that the drivers are giving the young Brit exactly the wake-up call that he needs at this stage. But they would be better employed to be discussing Heidfeld's call for professional stewards. The FIA have been notoriously difficult to deflect from their worst excesses of late and nothing less than a united front is likely to get Mosley to improve the way stewards are selected. When the FIA president can openly get rid of the one decent steward in the system and replace him with one of Max's cronies, the hope that the FIA are interested in fairness seems forlorn indeed. The FIA is rumored to be considering changes to the stewarding system for next year. Those who are expecting that these will be changes to make things more equitable and professional have my admiration - they have somehow retained some faith in an administration that has repeatedly demonstrated its incompetence and bad judgement. Me, I have become too cynical for that. Spot on again Clive!. The drivers have created a rod to beat themselves with, and now that it is swinging wildly and unpredictably and no longer aimed just at Lewis they are starting to worry. The drivers attitude towards Lewis reminds me of the story about Jeff Beck the guitarist, upon seeing Jimi Hendrix for the first time he`s thoughts were " Well thats me stuffed! , I might as well go back to spraying cars" . As for a stewarding change the only thing that will make it work is if they follow the old saying " A new broom, sweeps clean", but if Max is reconsidering he`s retirement now that he`s dirty secret is out no amount of reshuffling will remove the corrupt smell that hovers around F1. Which reminds me Clive, what is your take on Bernie`s skill to corrupt Tony Blair in the space of two hours after meeting him, when it took George W at least two weeks to achieve the same thing. Very timely post. I read in the brazilian press that GPDA has suggested that an ex-driver should be among the stewards at every race next season. Philosophically, I think races should be decided on the track. But frankly the problem is sportsmanship, or the lack of it, and it traces its history back to the tactics of Ayrton Senna, particularly against Alain Prost. I think we are indeed continuing to experience the aftermath of the FIA's failure in sanction that (Senna's) behaviour then and what we are witnessing is an attempt to reign in Mr. Hamilton and others with penalties and results that are more appropriate at a NASCAR event. Like his great hero Senna before him, the concept of sportsmanship is apparently anathema to Mr. Hamilton. I applaud Kimi for not spearing him off the road, a NASCAR like move that Hamilton probably deserved. Perhaps young Lewis will discover sportsmanship as he hopefully matures. If he becomes World Champion, as he appears likely to do, I would hope he is roundly criticized for his behaviour. It is not something to be proud of and in my opininion certainly not something to be condoned in the lower formulas. Gusto: I avoid saying anything about international politics - it's a subject that people get too emotional about (even more so than F1!). But anyone who thinks Bernie is not a very clever negotiator is wrong. He's proved over and over again that he knows how to get his own way and that is partly what is wrong with F1. Filipe: Yes, that is a good suggestion regarding the stewarding of the sport. Unfortunately, I don't think the FIA will take any notice of what anyone else thinks. A.J. : Whilst I agree with you that sportsmanship has become a rare commodity in F1, I don't think that Senna was to blame for this. People forget that it was Prost who first won a championship by pushing Senna off. Long before that, Alan Jones made sure of his 1980 championship by squeezing Piquet into the wall at the start of the Canadian GP. I don't see any of Hamilton's driving as being more aggressive and dangerous than any other driver's today. It seems to me that anything he does is exaggerated out of all proportion by his detractors and similar instances by others conveniently ignored. Lewis closing the door on Glock at Monza is brought up time and again but nothing is said of Raikkonen's exactly similar move on his own team mate at Spa. One can argue over whether such moves are sporting and should be allowed but the fact is that, at the moment, they are and all the drivers use them regularly. BBC five live had a couple of interesting comments on the Fuji nonsense. First at the drivers' meeting Charlie Whiting told them anyone exiting the pits had right of way in the first corner. It looks like Charlie orgot the line about unless a Ferrari is on the main straight. Kubica apparently told the press in China that he was happy that Lewis and others overshot the first corner as he missed his braking point and would probably have wiped them out had they not overshot. I am sure this will get no coverage anywhere else because it doesn't fit in the with the Lewis drove like a maniac nonsense. You mean by nearly hitting at least two drivers (Kovalainen and Raikkonen), Hamilton avoided a huge first-corner pile-up? That is absolutely amazing in its improbability. But then this is F1, where improbability is largely what keeps it running, so it may well be true. Considering that Ecclestone and Mosley are both retired drivers, I can't see that hiring retired drivers will change anything at all. How about hiring HONEST people with CREDIBILITY. It is not the profession that makes the man. Sportsmanship is highly overrated. People were were more careful when the cars were more lethal. The new cars are close to accident proof so the drivers aren't afraid to try anything. In the past it was a question of survival, not sportsmanship. The same thing has happened in ice hockey. The players wear helmets and face guards now and head injuries are more common than ever because of the security, albeit false, the hockey players have. If you consider he finished 78 seconds behind Alonso (hence he`s rush to unlap himself at the end of the race), minus 25 for the penalty, plus minus 20-30 seconds for the pointing the wrong way episode, that gives us minus 23-33 seconds at the least to make up before the end of the race by lap four, without throwing in the loss of speed due to aero damage Lewis was looking good for a champange finish. I have been watching F1 since the early 70s, and until Senna arrived you never saw the chopping and weaving that has become so popular. Senna had 8 or 9 crashes with major drivers between 86 and 90, and who will ever forget Senna putting Prost within inches of his life near the pitlane at Estoril. I would choose to characterize the first and most infamous Prost/Senna Suzuka incident as Senna putting his nose where it should not have been after a season of behaving like a rock ape, not Prost "pushing Senna off" - and by the way, Prost was already a World Champ at that point in his career. Senna's lack of respect for Prost (or anyone else) in my mind, is indeed the root cause of the lack of sportsmanship in F1. That said, I agree that Hamilton is no different than anyone else out there, but I think Brits in general are so sensitive about Hamilton because there is no question of his sublime driving abilities - its the ethics or lack thereof in his driving that drives you guys nuts - and deservedly so IMHO. He does not have to behave like that. There are plenty of ways to drive aggressive and fairly, like a Gilles Villeneuve, for example. Alianora: Have a look at the helicopter view of the start at Fuji and you will see that Hamilton did not come anywhere near hitting Kovalainen - he was a car's length ahead of the Finn when he moved to his right. As for nearly hitting Raikkonen, they did in fact touch wheels, not because Hamilton moved towards the Ferrari but because Raikkonen stopped going to his left and came back right again. So Kimi was the one who made the move look more dangerous than it was, although it was a perfectly normal start for these days when cars dodge about all over the place. AJ: We will never agree on Senna, I can see that. I have followed F1 since the early 60s and I have never seen anything to compare with the Brazilian's talent. He was a tough competitor, certainly, but I think you need to itemize these 8 or 9 top drivers that he crashed with - I cannot recall any such incidents until the battles with Prost. As for Senna sticking his nose where it should not have been, have a look at the video and I think you will have to agree that it was a normal overtaking maneuver in which Senna has unquestionably gained the inside line for the corner. Prost just turned into him, rather than allow him room (as Hamilton did for Raikkonen at the Bus Stop chicane at Spa this year). Although I agree with you that drivers are more aggressive in their moves these days, I do not think that Hamilton is any worse than the rest of them. In the context of what is usually allowed, he is well within the limits. It is only the obsessive concentration on him by the media and the FIA that creates the impression that he is doing anything that others do not do in the same circumstances. I love your blog, you always inspire and provoke thoughtful dialogue and I appreciate that. I agree with regard to Senna’s talent, but his on track ruthlessness and lack of ethics and sportsmanship far outweighted his driving talents, however sublime they were. I recall lots of collisions in Senna’s day, with drivers such as Mansell (Rio in 86, Spa in 87, Estoril 89), Schlesser (monza 88), Berger (Rio in 89), Prost/Suzuka (89 and 90) and Nannini also Suzuka 90. There were more, as I think his collision rate actually increased the older he got. Thanks for the links to the 89 crash video – I have not seen that particular in car version before. Normal overtaking maneuver? There? I completely disagree. Way too late. I still do not understand what Senna was thinking – that he could get away with that small gap at that chicane – he had no business there. At no time is he ahead of Prost and Prost drove the normal racing line. What the video does not show is the jink Prost made at Senna, which according to today’s rules you are allowed one defensive move (I think – although given what I have witnessed lately, perhaps that rule has been abandoned?) In any event, crash blames are normally the fault at those whom crash from behind, and I see no deviation from that here. Hamilton is still developing and it remains to be seen just how good he will become. The media does have a lot to answer for in the way he is seen, however; without the inflated hype of last year there would have been much less of a backlash this season. That is what has caused his every action and statement to be examined in minute detail and people lose their sense of proportion as a result.